With pic: Aerial images of land which is being developed by Stiller Warehousing and Distribution on Aycliffe Business Park to accommodate 32,000 sq ft of new external industrial storage space. Newton Aycliffe family business Stiller Warehousing and Distribution is developing unused areas of land on its 20 acre site to accommodate a surge in new business which has taken existing storage space full to capacity. That includes its new 40,000 sq ft, 5,000-pallet warehouse which it opened last year at a cost of £1.1m, which is also full to capacity and is being used mainly by local packaging companies. Stiller is now planning to construct another new warehouse, expected to be completed later this year, to sit alongside its new facility and which will further increase its storage footprint. But in order to make space for the new development, Stiller is spending £60,000 on creating two new external storage areas totalling 32,000 sq ft to accommodate industrial materials which need to be stored outside. The two plots, each 16,000 sq ft in size, will store heavy tooling, machinery and metal storage crates for local customers including neighbouring car parts manufacturer Gestamp Tallent. The groundwork for both sites is being done by Aycliffe firm John Wade Group using recycled aggregates. And Stiller says this latest development is further testament to the buoyant climate on Aycliffe Business Park. Commercial manager Matthew Stiller said: “We have to develop the two disused areas so we can relocate and expand our existing external storage space. “It’s mainly for heavy industrial use, and a lot of the space will be taken up by Gestamp Tallent, which will use it to store heavy presses they use in their press shop to form their sub-frames. “It’s certainly another sign that Aycliffe Business Park continues to grow and expand. Our neighbours are running out of space and that’s when they come to us for additional storage. 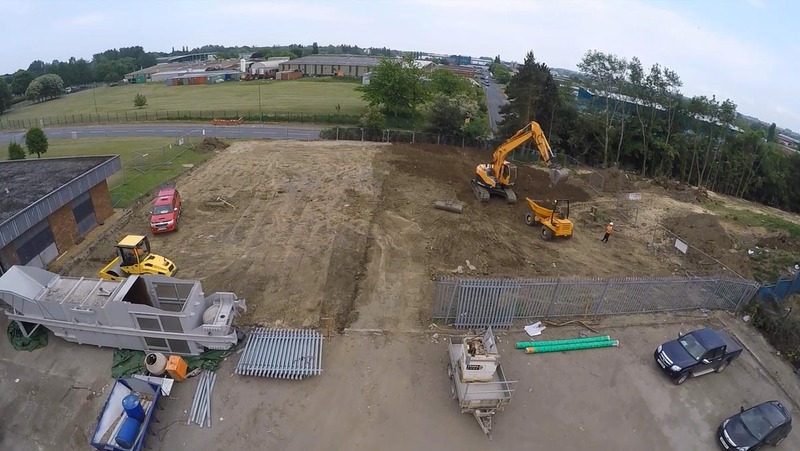 John Wade Group last year developed a 50,000 sq ft piece of disused land on Stiller’s site to create extra lorry parking to house Stiller’s growing fleet of vehicles. And last September, the family firm opened a new multi-user warehousing facility, costing £1.1m, which increased Stiller’s storage footprint to 180,000 sq ft. It enabled the company to explore new “clean” markets, and the new site is used by several local firms including West Auckland-based packing solutions firm Smurfit Kappa. “We’re delighted with the development of the company in recent years and we’re extremely positive about the future,” added Matthew. Stiller’s turnover climbed from £10m to £13m in 2015, after the firm made significant investments of more than £5.7m on equipment and people over the last two-and-a-half years. The firm spent £125,000 in five brand new trailers at the end of last year, and earlier in 2015 it invested £1.1m on a new state-of-the-art, 40,000 sq ft, 5,000-pallet warehouse, increasing by nearly 50% its warehousing capacity. That followed the acquisition of a fleet of 12 new vehicles, including two 12-tonne vehicles, two urban trailers and four long double-deck trailers in 2014.